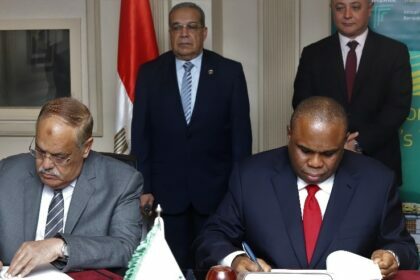 Afreximbank President Prof. Benedict Oramah (R) and Lt. Gen. Abdel Moneim Eltarass, Chairman, Arab Organization for Industrialization (AOI), signing the memorandum of understanding at the AOI headquarters in Cairo. Afreximbank President Prof. Benedict Oramah (centre), flanked by other members of the Afreximbank delegation, makes a point at the signing ceremony. 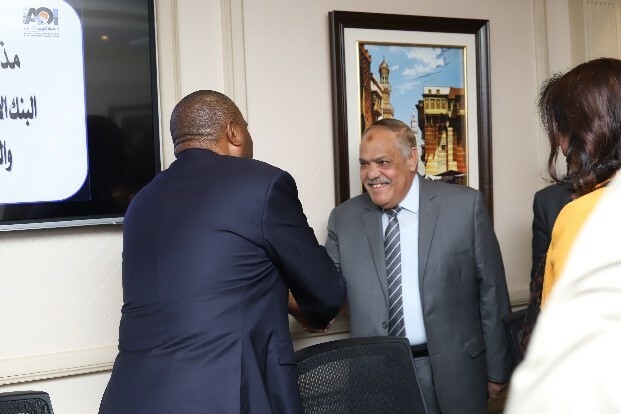 The African Export-Import Bank (Afreximbank) yesterday in Cairo signed a memorandum of understanding (MoU) with the Arab Organisation for Industrialization (AOI) to cooperate in pursuing opportunities for Africa’s development through industrialization. 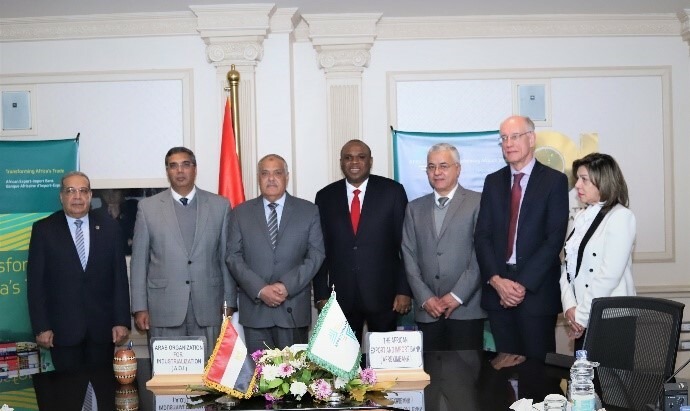 Prof. Benedict Oramah, President of Afreximbank, and Lt. Gen. Abdel Moneim Eltarass, Chairman of the Arab Organization for Industrialization (AOI), signed the MoU on behalf of their respective organisations during a ceremony at the AOI headquarters. Speaking during the ceremony, Prof. Oramah said that the MoU would help to strengthen the Bank’s relationship with strategic entities in Egypt and would demonstrate Afreximbank’s strong support for the Egyptian economy. The MoU represents the commitment of Afreximbank and AOI to enhancing the levels of industrialisation and export manufacturing within Africa and to pursuing opportunities to advance the continent’s development through industrialization and supply chain, said the President. 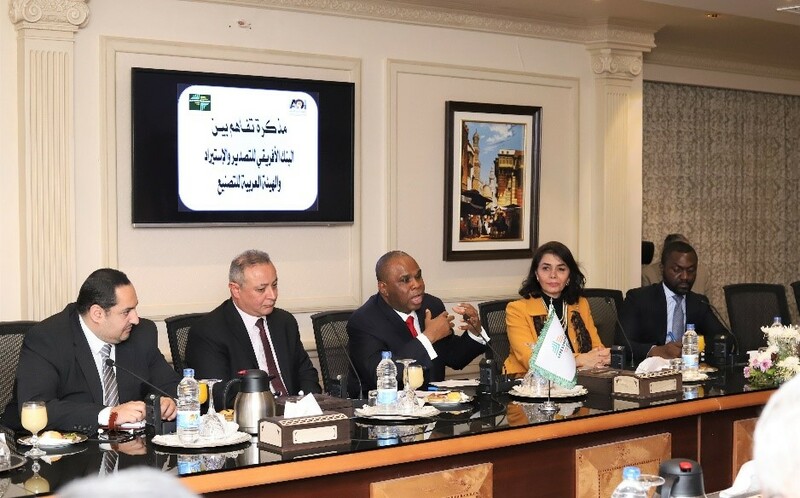 According to him, as one of the most prominent industrial organizations in the North Africa region, AOI will be cooperating with Afreximbank to support the development of Africa’s civil sector, which includes infrastructure projects, railway equipment, renewable energy, electronics, medical equipment, vehicles, and wood and fiber-glass products. In his contribution, Lt. Gen. Eltarass said that as Chairman of the African Union for 2019, Egyptian President Abdel Fatah Al Sisi had directed Egyptian entities, including AOI, to bolster cooperation with African entities. President Benedict Oramah of Afreximbank (centre) and Lt. Gen Abdel Moneim Eltarass, Chairman of AOI (3rd left), in group photo with members of the AOI delegation. He announced that AOI was already working with many organizations in that regard, including Arab Contractors, Holding Company for Chemical Industries, Egyptian German Electrical Manufacturing Company and BESIX. AOI, which was established in 1975 by the Egyptian government to create technology-based industries in the Arab world, currently has 13 manufacturing plants in Egypt.